With the largest population of any other member state in the European Union and the third largest economy by GDP in the world, it's probably fair to say that Germany is up there with only a handful of other nations as one of the world's true superpowers. In addition, if asked to name a major German metropolis, then Berlin or Munich would perhaps spring to most people's minds. But, it is actually Germany's fifth largest city, Frankfurt that has emerged as one of the two largest financial centres in continental Europe, as well as being among the world's financial elite. Indeed, with the abundance of banks and large businesses situated in the city, this has helped craft an impressive skyline. In fact, two of the four tallest buildings in Europe are found in Frankfurt, giving rise to the suitable nickname of "Little Manhattan". Furthermore, you can experience stunning views of the cityscape at night from the Eiserner Steg Bridge, which is a major highlight for anyone who makes a trip to this city. Hotel Continental is situated 100 metres from the main railway station and 500 metres from the Main riverbank with its many museums. After a buffet breakfast (surcharge), guests ask staff for advice on sightseeing in and around Frankfurt. Other practical amenities include a safe-deposit box at the 24-hour front desk, and laundry and dry cleaning facilities. The hotel is less than three kilometres from the city centre where guests will find a fairground and large park. The botanical gardens and zoo are less than four kilometres away. 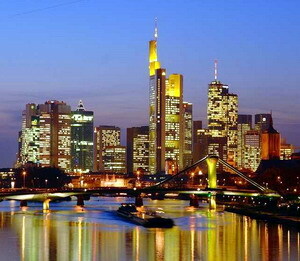 Frankfurt Airport is 12 kilometres from the hotel, around 15 minutes by car. Fleming's Hotel Frankfurt an der Neuen Borse is located in Frankfurt, Germany, 300 metres from the Neue Borse Stock Exchange and four kilometres from the Frankfurt Messe (conference center). Whimsical Frankfurt attractions within five kilometres include Palmengarten (botanical gardens) and the Frankfurt Old Opera House. The on-site health club features a sauna, steam room and fitness equipment. A casual brasserie is the setting of the hotel's restaurant, Fleming's Brasserie & Delicatessen. The hotel features conference facilities, a business center and complimentary high-speed Internet access. Simple guestrooms feature dark wooden headboards. Floor-to-ceiling windows feature neutral drapes. Amenities include satellite television and complimentary wireless Internet access. Minibars are available. 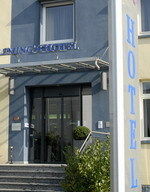 The Hotel Hamburger Hof is a unique property strategically located just 7 miles away from the Frankfurt Main Airport. 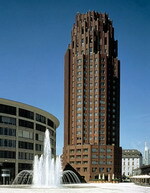 As a guest of the Hamburger Hof your home is in the city center of Frankfurt opposite Central Station. This convenient location and much more are qualities that make the Hamburger Hof an ideal lodging choice for those visiting the area. Local attractions worth visiting that are within close proximity of the hotel include The Romer, Goethe-Haus, Stadel Gallery and the Senckenberg Museum of Natural History. A professional staff has made their effort to give you a friendly, cozy feeling to ensure enjoyment of your stay in Frankfurt, with all the comfort and quality you would expect. Come experience world-class accommodations and quality on a whole new level at the Hamburger Hof Hotel. 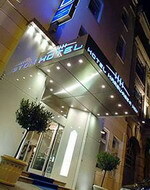 The modern InterCityHotel Frankfurt is located in central Frankfurt, Germany, 100 metres from the main station and 500 metres from the high-rise financial district. 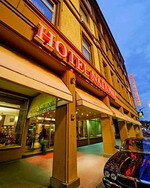 The brick-built hotel is within three kilometres of the Old Opera House and Museum Mile. Frankfurt Airport (FRA) is 10 kilometres away. 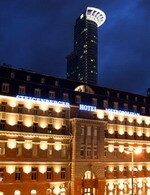 Guests at the InterCityHotel Frankfurt receive a pass for complimentary use of Frankfurt's public transport network. Breakfast, lunch and dinner are served in the hotel's contemporary restaurant, where a fusion of local and Italian dishes are on the menu. In summer, guests can dine alfresco in the beer garden. With wood furniture, the softly lit Mainhatten Bar offers drinks and cocktails. The InterCityHotel Frankfurt's meeting rooms accommodate up to 120 people. Complimentary Internet access and a 24-hour front desk are available. The onsite spa includes a sauna, solarium and fitness centre with the latest equipment. The Lindner Hotel Main Plaza Frankfurt is a high rise property drawing architectural inspiration from 1930's New York, towering over the bustling Sachsenhausen next to the river Main. The hotel's New Brick restaurant offers Californian dishes and an extensive wine list. Harry's Bar was designed to extend the hotel's New York theme and serves over 130 different cocktails with modern surroundings of wood floors and low- level lighting features. Guests can also unwind in the hotel's onsite health centre, which comes equipped with sauna, steam bath and indoor swimming pool. Beauty and massage treatments are also offered. Conferences and business meetings can also be held with a maximum room capacity of 60 delegates. Visitors to the city will find a large number of cultural attractions nearby with the Museumsufer district 500 metres from the hotel, where museums for film, architecture and applied art can be found. The city's zoo is also worth a visit (three kilometres from hotel). 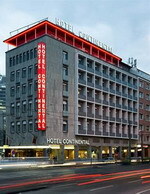 The Hotel National is located in Frankfurt-am-Main, Germany, 400 metres from Frankfurt am Main central railway station. The hotel has a front desk which is open 24 hours a day and offers concierge services as well as a safe-deposit box in which guests valuables can be stored; coffee is served in the lobby, and there is a television. Hotel National has an onsite restaurant, Le Petit, which serves both international and German dishes. Breakfast is complimentary. He Apo Bar serves cocktails and speciality beers and has an extensive wine list. For a surcharge, business services are available. There are conference rooms on site, and the hotel s public areas offer complimentary wireless Internet access. The hotel s four floors hold 77 guestrooms, which offer direct-dial phones, cable television, high-speed Internet access, and minibars. 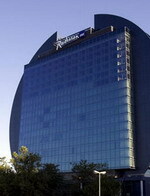 The Radisson SAS Hotel is a landmark contemporary-design hotel; an 87-metre high building composed of a glass cube seemingly held inside a shining blue disc. It is 1 kilometre from Frankfurt Exhibition Centre and 4 kilometres from the cultural and financial districts of the city centre. The hotel offers two dining options: open for lunch and dinner the Coast Brasserie and Oyster Bar serves a wide range of seafood and Pacific Rim dishes in a relaxed, modern setting with open kitchen, while the Gaia Restaurant offers a buffet breakfast and an all-day menu of Mediterranean dishes with an outdoor terrace area for warmer days. The lobby bar features a suspended glass wine tower and there is also a modern lounge bar with an adjacent cigar room, serving drinks and cocktails throughout the day until late. Guests can workout in the hotel's fully-equipped fitness centre which is situated at the top of the hotel and offers panoramic views of the city skyline. It also offers an indoor infinity pool, sauna, steam room and massage-treatment area. 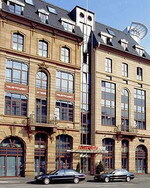 Historic property with sandstone facade set within 500 metres of Frankfurt's financial centre, known affectionately as "Mainhatten". Guests have a choice of 3 restaurants: Fine Dining Metropolitan restaurant is a formal restaurant with Art Deco setting; Brasserie M offers international dishes; the Metropolitan Bar and Lounge serves drinks and cocktails in a British Gentleman's style setting. Guests can relax with pampering massage treatments in the hotel's health club, which also offers a sauna, steam room and a solarium. Guests can use the wireless Internet services to plan a day's sightseeing or seek assistance from staff at the 24-hour front desk. The hotel also offers round-the-clock room service and a valet parking service. Guests can also visit the historic city centre, three kilometres from the hotel; the Museumsufer, a collection of museums set on the riverbank, are also 3 kilometres from the hotel. Frankfurt International Airport is 10 kilometres away.